WVU Medicine announced today (Sept. 19) its plans to start West Virginia’s first heart transplant program at the WVU Heart and Vascular Institute. For a CONNECT photo gallery from the event, click here. Gov. 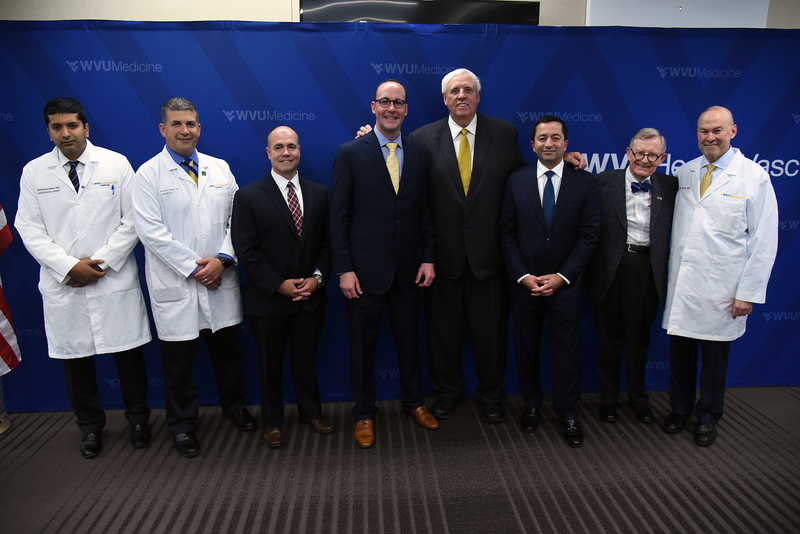 Jim Justice (fourth from right) joined WVU Medicine officials at a press conference today (Sept. 19) announcing plans to start a heart transplant program at the WVU Heart and Vascular Institute. Pictured with Justice are (from left to right) Muhammad Salman, MD, cardiothoracic surgeon; George Sokos, DO, cardiologist; Michael Shullo, associate vice president of transplant services; Albert L. Wright, Jr., president and CEO of the West Virginia University Health System; Justice: Vinay Badhwar, MD, executive chair of the WVU Heart and Vascular Institute; Gordon Gee, WVU president and chair of the WVU Health System Board of Directors; and Clay B. Marsh, MD, vice president and executive dean for WVU Health Sciences.